The S150 spectrometer is designed to analyse spectra of CW and pulsed laser light sources. Due to its relatively low aperture ratio and high spectral resolution the S150 perfectly suits for wavelength measurements of lasers, diodes and other sources emitting high-power optical signals. The spectral range and resolution (i.e. grating lines density) are chosen at the time of placing your order. For your convenience the SPECIFICATIONS lists the average values of grating dispersion, spectral resolution and multichannel array bandpass corresponding to a certain grating. Contact a SOLAR LS specialist for more precise calculation of parameters for your instrument. The S150 may contain a CCD detector based on either one of three non-cooled linear image sensors (see the SPECIFICATIONS). The TCD1304 linear image sensor is the most popular due to its high sensitivity and narrow pixels capable of providing high spectral resolution. The S150 is convenient and easy to use: it is calibrated by the manufacturer, does not contain any movable parts, is controlled and powered from the computer via the Full-Speed USB interface. The S150 can be triggered from your light source with standard TTL trigger pulses via connector BNC-58. The S150 is also able to produce TTL trigger pulses. The S150 delivery set contains a USB control cable, direct and reverse synchronisation cables and UV optical fiber. Light input with the optical fiber provides flexible arrangement of your instrumentation system. 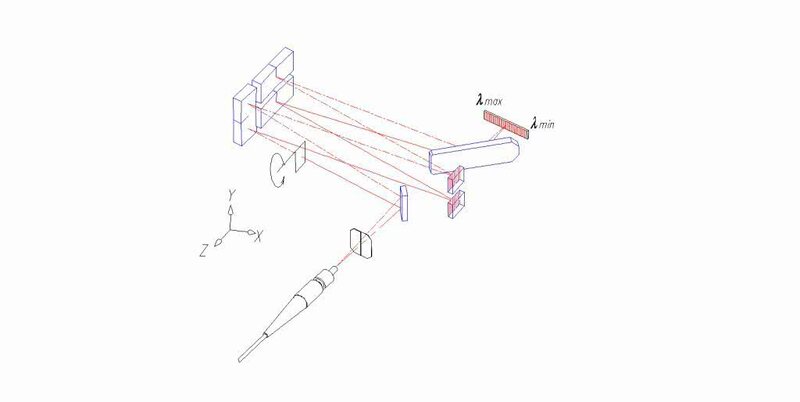 The spectrometer is able to operate without the optical fiber, with analysed light steered directly to its input slit. To meet both of the conflicting demands, high resolution and wide operation range, within a single compact device we have developed the two-channel spectrometer S150-II. 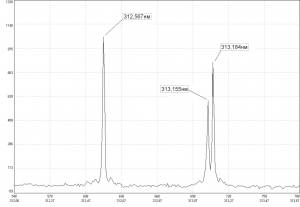 The optical bench design of the S150-II two-channel spectrometer provides possibility of installing either two of diffraction gratings listed in the SPECIFICATIONS, with alternate recording of channels spectral ranges. 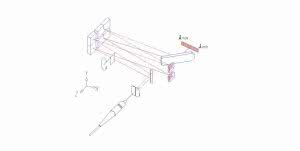 Yet the optical bench of the S150-II spectrometer does not contain any movable parts. The only moving element is a shutter which interrupts the optical beam in one of the channels. 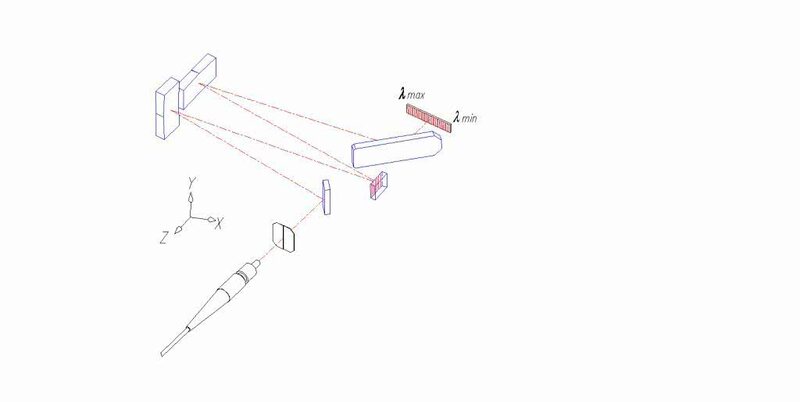 The shutter is moved from one channel to the other (changing the spectral operation range of the S150-II spectrometer) manually by a simple turn of the two-position switch. wide spectral interval (up to 200-1100 nm) with resolution of 0.5nm and a selected narrow spectrum range with resolution up to 0.015 nm (analogue of two S150 spectrometers with different gratings), as well as other combinations of spectral ranges at your choice. 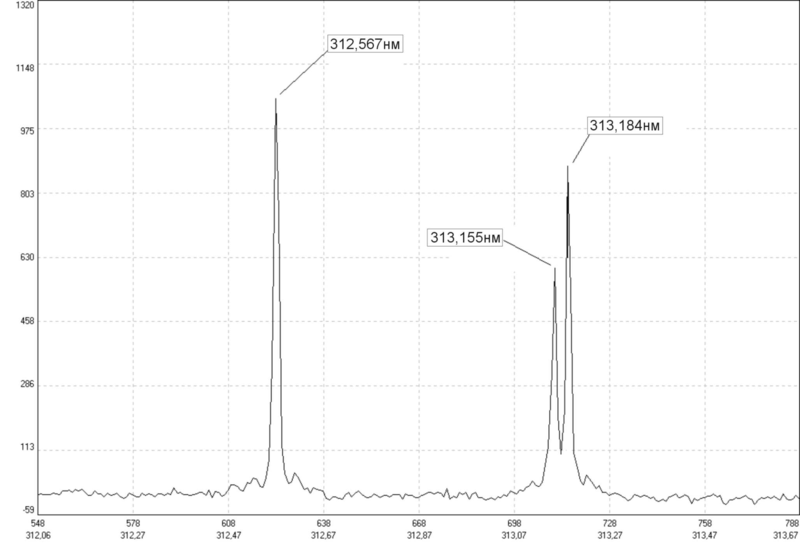 1) Spectral resolution of the S150 spectrometer is indicated for the detection system based on the TCD1304 linear image sensor. 1) Max. exposure time is the time when the dark signal reaches 10% of the dynamic range at +25°C ambient. 3) The S8378-512 linear image sensor provides possibility of control over sensitivity mode: high (HS) or low (LS). 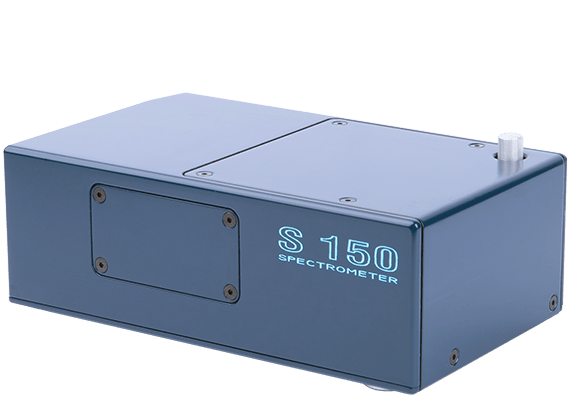 The S150 spectrometer with the diffraction grating 1800 lines/mm, operating in the 3rd spectral order within the range 200-350nm (width of the simultaneously recorded spectral interval is 23nm) allows resolving lines of Hg 313.184nm and 313.155nm, with distance between lines 29pm. A fragment of the respective spectrum is shown below. The choice of the grating with a large number of lines/mm will lead to a better expected resolution and a narrower multichannel array bandpass. Blaze wavelength affects grating efficiency. It is selected at the time of the spectrometer order.